The GE Z-Wave Motion Sensor Dimmer Switch is combination dimmer switch and motion detector that when configured with the proper SmartThings device type handler (DTH) can locally control a light when there is movement in the room. This document outlines the installation and usage of this custom DTH. 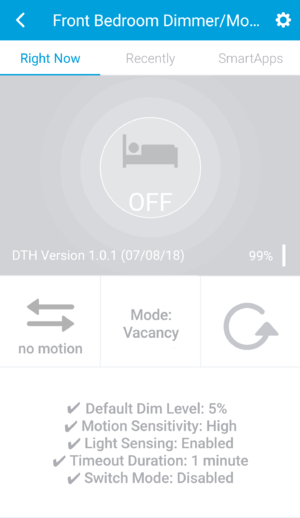 In addition, this DTH allows for you to directly control other Z-Wave switches within your SmartThings environment, allowing you to have a bit of automation without the need to program. you can add multiple Z-Wave Motion Sensor Dimmers as long as this code is in place. 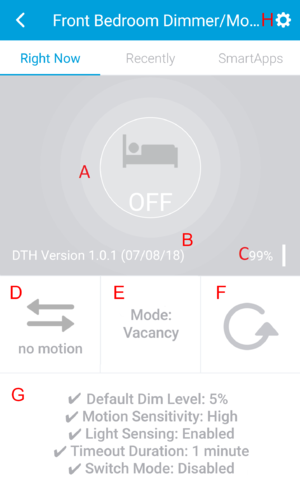 While a user can set the capabilities of the dimmer using the Settings area (GE_Z-Wave_Motion_Sensor_Dimmer_Switch#Settings), advanced users/developers can access many of these same settings from applications using the commands below. Many of these commands are already used in applications like WebCoRE or Ask Alexa. 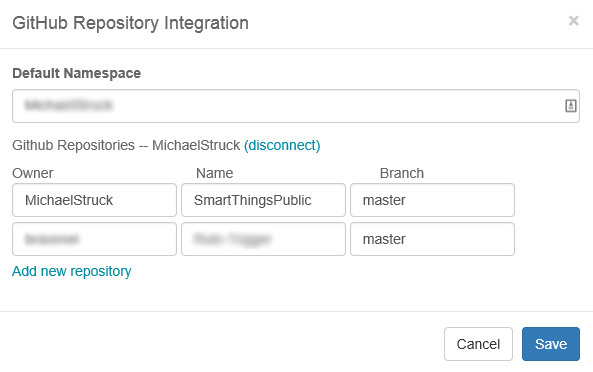 Changing these setting via other applications will display a log entry in SmartThings' Live Logging. Please note that all these commands are case-sensitive. This command is exclusive to the GE Z-Wave Motion Sensor Dimmer Switch and it allows you to programmatically define the level of the switch when it turns on. This is useful to 'reset' the switch to a default level when it is turned off in case it was set lower the last time it was used. 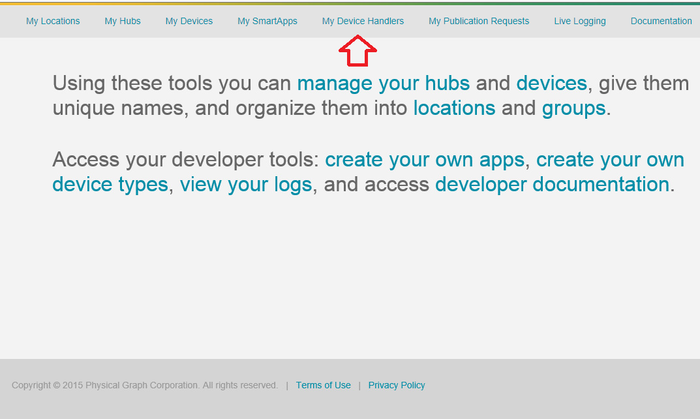 If you change this to number and it differs than how you have it set within the device's settings area, a small "!!" will appear in your dashboard to indicate this. These commands allow you to control how the dimmer operates. You can turn the dimmer in to an on/off switch that will go from 0 to 100 and back to 0, with dimming capabilities disabled. This is useful when setting up a room where the normal operation (for example, during the day) is simply on or off. But at night, you can have it change to a dimmer (possibly using the default dim level (GE_Z-Wave_Motion_Sensor_Dimmer_Switch#Default_Level) for less harsh lighting in certain situations.